Ueno is probably the part of Tokyo which I have visited most often over the years- with the excellent collection of museums found in and around its park ( also famous for its cherry blossoms) being the main reason why. Just to give you some idea, in the past week alone I have made the trip there twice, in order to see two top-notch currently showing special exhibitions which I hope to write about soon.. But despite the fact that travelling between Tsukuba and Ueno is fast and convenient ( using either the Tsukuba Express or Joban Lines), I often find myself pressed for time when going to exhibits, and more often than not have to rush directly from the station to one of the museums and then back again, without the leisure of being able to appreciate any of the other numerous things to do or see in the area. It`s probably the same with you, too. Still, each and every time I enter Ueno park , even if I`m only zipping through, I spend some time (no matter how little) contemplating its rich history. And as someone who has long lived near Mt. Tsukuba, I have come to feel a strong connection between the two places- Ueno and Mt. Tsukuba. Why? Because of the KIMON (鬼門)- the unluckly North-Eastern quadrant. The direction from which it has long been most feared that disaster would come. Even today, many Jpanese are concerned with the KIMON. I know many families in Tsukuba who try to fend off the misfortune which might come from the North-East with either strategically placed salt, nandien bushes- or a combination of the two. In past ages, such matters were taken much more seriously. Out of concern for the danger which might come from the KIMON, Japan`s Emperors in Kyoto had a huge temple complex – Enryaku-Ji – built and maintained on Mt. Hiei, directly to the north-east of the old Imperial Palace. The idea behind this was to protect the ancient capital from that direction with prayer and Buddhist rituals. In the same way, the founder of Japan`s great Tokugawa Shogunate, Tokugawa Ieyasu, in the hope of protecting himself from the perils of the unlucky direction, also constructed and maintained a huge temple complex called Kan-ei Ji, directly to the north-east of Edo Castle ( now the Imperial Palace in Tokyo)- at a site which is now Ueno Park! But the Tokugawa Family did not stop there- since you never could have enough protection from the unlucky direction. Continuing about 50 km further, in a direct north-easterly line from the shoguns castle, stood Mt. Tsukuba. The temple that had been standing half-way up that mountain, founded hundreds of years earlier by the priest Tokuitsu, was deemed to be located in a vital position and turned into another key site for the protection of the Tokugawa Family and the city of Edo from the KIMON. Large amounts of money poured into the improvement and maintenan ce of the temple- called Chuzen-Ji- for as long as the Tokugawas stayed in power. A large sacred stone can still be seen on the old pilgrims path up Mt. Tsukuba, declaring the mountain to be in Edo Castles unlucky quadrant. The Tokugawas obviously did know a little about how to keep bad luck away- they were able to keep an absolute hold on power in Japan for more than 250 years. But eventually, things started to fall apart for them, and forces loyal to the Emperor triumphed after a civil war in the mid 19th century. Both the Kannei Ji Temple Complex in Ueno, and the Chuzen-Ji Temple Complex on Mt Tsukuba, long strongly connected with the Tokugawa family, were destroyed. 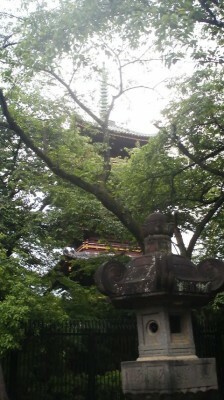 Upon the site where the Chuzen-Ji temple once stood, a shrine, the Mt. 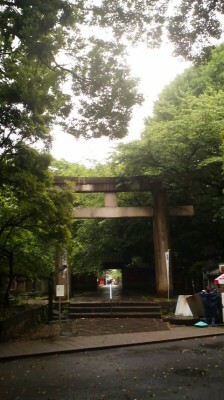 Tsukuba Shrine was built. 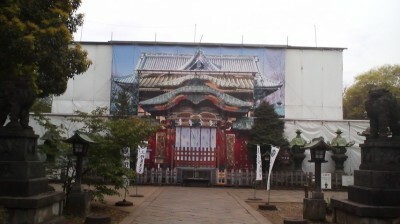 Only a few of the great temple complex`s old structures were saved and relocated to other places in Tsukuba. The same happened with the huge temple complex which once stood in Ueno. A few remnants survived- most notably the five-tiered pagoda which is now within the grounds of the Ueno Zoo ( an intentional insult to the Tokugawa`s?). 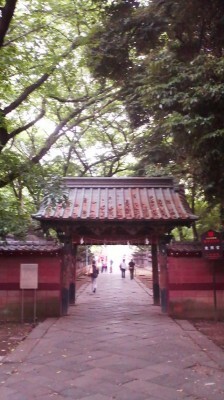 One surviving temple gate can also be seen to the right of the National Museum. The wasteland which was created by the destruction of the temple complex was going to be turned into a hospital by the newly formed Meiji Government. But on the advice of Dr. Anthonius Franciscus Bauduin, a Dutch medical doctor living in Japan at the time, a park was established at the site in 1873. 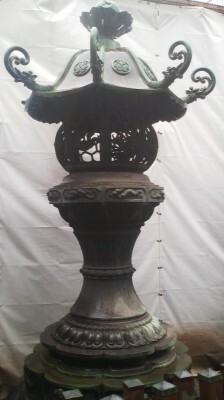 The most important structures directly related to the Tokugawa`s which have survived in the Ueno area, however, belong to the Ueno Toshogu Shrine. Like its much more famous namesake in Nikko, Tochigi Prefecture ( which is a World Heritage Site)- this is a place where the spirit of Tokugawa Ieyasu has been enshrined and is worshipped as a deity. A shrine at this site was first dedicated to Ieyasu in 1627, and it was formally named Toshigu in 146. Toshogu means : A light to the east, which is very appropriate since it was Ieyasu who set up his ruling seat to Eastern Japan and turned the city he made great is now called the Eastern Capital (Tokyo). Many who have written about this shrine have expressed their great surprise at how it had survived the anti-Tokugawa zeal of the Imperial forces. For me, however, it is no surprise at all, since the Pro-Imperial fanatics would never destroy a Shinto Shrine- they were specifically targetting the Tokugawa`s Buddhist buildings in Ueno and on Mt. Tsukuba. I must admit , however, that the fact that the old structures survived both the Great Kanto Eathquake of 1927 and the Great Air-Raid of 1945, is remarkable. American soldiered in Japan just after Japan`s surrender did do some damage, however, breaking off pieces of the large copper burners as souvenirs. Anyway, when I have even the least bit of spare time in Ueno, I take a little detour and walk to Ueno Toshogu. Its just to the left of the main entrance to the zoo ( which by the way, I have never been to. I have never gotten over the sad stories I`ve heard of how many of the animals there were poisoned or starved to death during the war). You walk under a big old stone torii, and then through an interesting Chinese style gate. 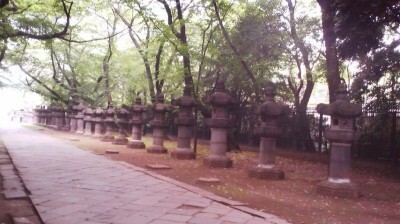 The worshippers path is then lined with stone lanterns, each having been donated by different DAIMYO (regional warlords) to honor Ieyasu`s spirit. Then even more interestingly, there are about 50 large copper objects which look like lanterns but which are in fact burners, used for the burning of sacred fires which were created for various rituals. 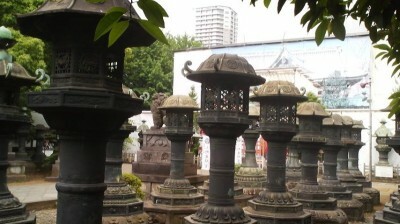 Each one of these stone lanterns and copper burners is slightly different and has the name of the donor written on it. Last week as I made my way down the path, I looked ahead to get a glimpse of the shrines famous KARA MON- the Chinese style gate which stands in front of the Worship Hall. I readied my cell phone and took some pictures. I tried to get a shot which also included some worshippers praying in front of it. I was glad when I thought I had successfully done this. But then, after I had passed the Hiroshima Memorial on the right and prepared to approach the famous structure, I realized that what I had seen from afar was only a giant picture of the KARA MON and the worship hall behind it! I have never seen anything like it before! A Potemkin Shrine! 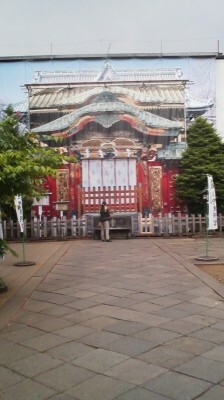 A beautiful facade put up while the shrine itself is closed for rennovation. And I would not be able to go inside the shrine and enjoy its treasures (including a famous pair of ascending and desending dragons). Instead of being disappointed, though, I enjoyed the clever, and as far as I know unique scaffolding idea. I will, however, be going to get my eyes checked! If you are in Ueno, have a look! The votive tablets (e-ma) sold at the Ueno Toshogu Shrine show Tokugawa Ieyasu as a Tanuki (raccoon dog) which is known in Japan for its craftiness. 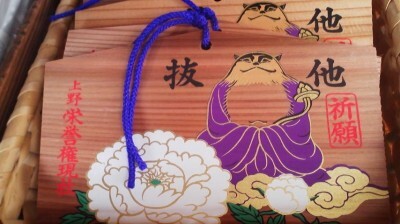 A play of words on the name TANUKI is also used symbolically to mean- PASSING THE OTHERS. A person`s life is like going a long distance with a heavy burden on ones back. If you think of suffering as an ordinary state, you will never be discontent. If an ambitious desire seizes you, think of the days of hardship you have passed through. Remember that forgiveness is the foundation of eternal prosperity and anger is the enemy. If you only know what it is to win and don`t know what it is to lose, you will suffer the harmful effects of complacency. Shortage is better tham abundance.